In order to resolve sender numbers, an installed MetaDirectory is required. The Meta Directory is liable to costs. The connection data to the MetaDirectory must be entered. 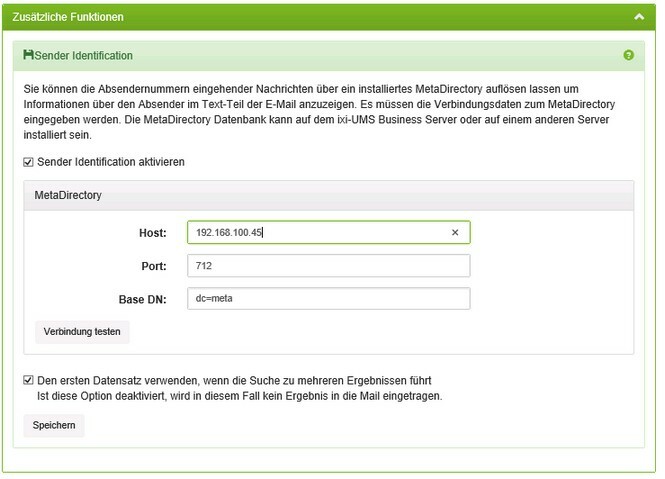 The MetaDirectory data base can be installed on the ixi-UMS Business-server or on another server. When the checkmark is set at "Use the first data..." and several results are found with a search, the data from the first data record are entered. If this option is disabled, data is only entered in the mail when the result is unambiguous.